I am honored to present Nancy Dillingham and her poetry. 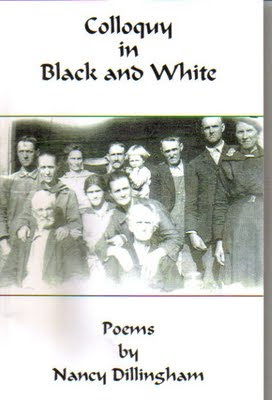 Nancy has a new book of poetry out from Catawba Publishers, titled Colloquy in Black and White: Poems by Nancy Dillingham, and she is gracious enough to allow us to reprint a couple of them here. I love Nancy's work. She's from my part of the world, and I think she allows us to view it with poignant, heartbreaking clarity. Writer and educator Nancy Dillingham is a sixth-generation Dillingham from Big Ivy in western North Carolina. Her poems, short stories, and commentary have appeared in various literary journals and newspapers such as The Arts Journal, Bay Leaves, Asheville Poetry Review, A Carolina Literary Companion, Half Tones to Jubilee, The Lyricist, Victoria Press, Raleigh News & Observer, Asheville Citizen-Times, Mountain Xpress, Western North Carolina Woman, Weaverville Tribune, and Big Ivy News. She is the author of five books of short stories and poems: New Ground (1998); The Ambiguity of Morning (2001); First Light: Poems (2003); Thanks for the Dark but That’s Not Home: Poems and Stories (2006); and, her latest, Colloquy in Black and White: Poems. 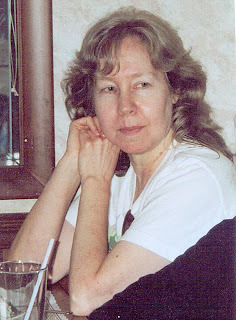 She is co-editor, along with Celia Miles of two anthologies: Christmas Presence from 45 western North Carolina women writers and Clothes Lines from 75 western North Carolina women writers. She also co-edited, with Irene Dillingham Richards and Ken Richards, The Family Named Dillingham: 375 Years in America--1630-2005. She lives in Asheville. with graffiti, mufti, and ink? and curtains to the wind? Love the Elvis poem!! It's always fun to consider the what-if's. . . I love it too, Vicki!